There is a common misconception in the general public regarding how artists work. Most people tend to think that everything we create comes out of our heads and we do everything free hand. I think it is time to burst that bubble. As much as we, as artists, would like for the world to think that we have some magical abilities that only we can wield, the truth is that most of us couldn't draw a straight line if we had to. At least not without the right tools. That doesn't mean that there are no artists out there that can take a pencil, draw something out of their imagination and have it come out perfect. I have very close friends that can do just that. But most of us need some tools to help us get the results that we are looking for. Even the masters, whose works are hanging in museums all over the world, used techniques to help them get their initial sketch perfect before they began creating their masterpieces. That is what we are discussing in today’s lesson: how to get your initial sketch perfect so that you can fill in all of the details. Draw a grid on your original source material. 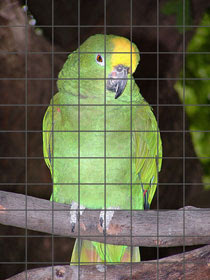 If your source image is something that you need to keep and do not want to destroy it by drawing on it, then you can draw a grid on a piece of clear acetate and lay that over your original image. The idea is to divide your image up into smaller sections that are easier to work with. 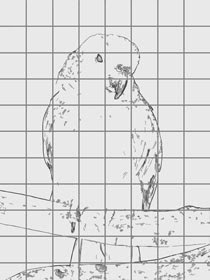 The more detailed your image is, the smaller you might want to make your grid. Normally and grid that ends up being around 10 squares wide is a good start. Start in the first square in the upper left corner. Draw in that square, the basic shapes that you see in the corresponding square in your original. You do not want to go into great detail here. All you are doing is creating a guideline that you will use to complete your drawing. So don’t get caught up in drawing every little detail. You will do the details later. Also, just like the grid, these lines should be drawn very lightly. This method is pretty simple, but can be expensive. Most art and hobby stores sell small projec tors that will project your image onto a surface. Just turn off the lights, project the source image to your paper and trace the contours. It works really well, but you have to deal with trying to draw in the dark. And don’t forget to draw the sketch very lightly. You will likely want to erase some of it later. Remember carbon copies? Well, this works much the same way. There are a couple of ways that you can go about this. The easiest way is to actually purchase graphite sheets that you can use the same way that you use carbon paper. Place the graphite paper on top of your art paper, then place your original on top of that, then you can draw on top of the original so that the graphite comes off of the graphite paper and sticks to your art paper. The downside is that you have to pay for the graphite paper. I am a cheapskate. I don’t like paying for things if I don’t have to. So, I have my own method of doing Graphite Copy. 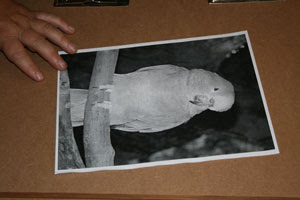 Create either an inkjet or laser jet copy of your original image in the size that you want your final creation to be. Lay the print out down on a hard surface, face down. 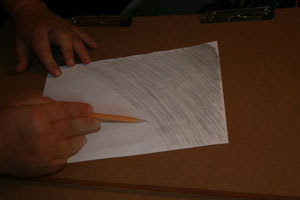 Take a 2B pencil and cover the entire back surface of the paper with a nice layer of graphite. 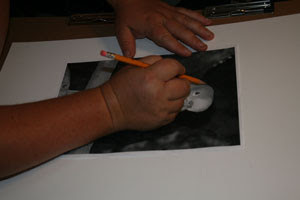 Now place the printout, graphite down, directly on top of your art paper and trace the contours of the image elements. Remove the printout and you will have a sketch on your paper. You will have to be very careful when tracing the elements. Only press hard enough to let the graphite come loose from the transfer paper. You do not want to press so hard that you actually create an indentation in the paper. I know that we are spending a lot of time going over things that aren’t actual drawing, but it is important information to get the best possible results from your efforts. In our next lesson we will talk about learning how to see. We will learn to train our brains to allow us to see what actually exists instead of what we think exists. bt copying the icture, isnt it a bit like cheating...i mean anybody can do tht? isnt it wrong?? That depends on what your goal is. If your goal is to create the piece of art completely free hand without any assistance then yes, that would be wrong because you are not achieving your goal. But here's the thing. I could spend hours, days and maybe even weeks sketching and erasing and tweaking in order to get exactly the same sketch that I would get if I spent ten minutes tracing the contours. Then I would have to transfer that sketch onto another sheet of paper anyway, because of all of the marks and eraser residue on the original sketch. In order for the shading technique to work correctly, you need for your sketch to be as clean as possible.